The Integram: an Integral Enneagram of Consciousness; a model of consciousness, including all aspects, for designing practical paths of personal development and evolution. No time? Listen to the podcast (8:08 min.) in the background while you file, exercise, ride to work, etc. in the moment. When a bear jumps out from behind a tree, it’s not going to serve us to take a moment to ascertain what the bear’s intentions are, and what our best course of action might be. We need to bolt. 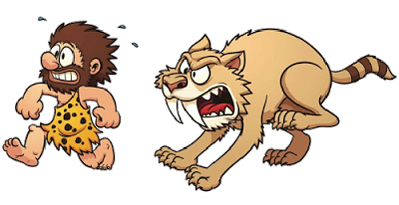 In fact, most of our reactions developed in accordance with survival and physical threats. or fight reaction, where neurochemicals and hormones replace thinking with action. Most people are pretty familiar with this sustained flight or fight state of mind having negative effects. Just how many negative effects, and how pervasive they are may surprise you. The physical damage has been well documented over the years, including everything from stress related cardiac issues to Cortisol-induced weigh gain. What’s far less obvious, and far more insidious is the emotional and psychological impact, including damage to our relationships and communication with others. And although we may think we’re pretty conscious of what’s going on, what we’re saying and doing, and how we’re going about that, an enormous amount of what drives us is under the surface. 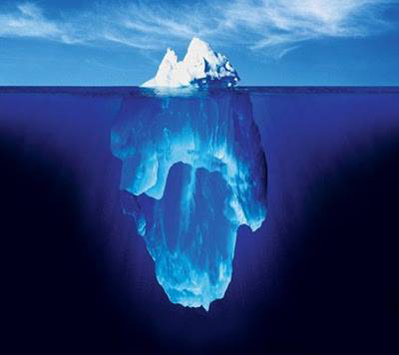 Just like an iceberg, the tip may be visible, but what’s driving that iceberg is the vast amount of it unseen below. This is our subconscious and unconscious mind; and the power behind reactivity. If only our subconscious communicated with us the way our conscious mind does. Well, it does communicate with us, but it uses a very different way to do so. Our subconscious and unconscious mind speaks to us through our bodies. Our body may understand words, but it uses the language of somatics. Some of these signals are loud enough and obvious enough for us to hear them. We know we get stomach aches, backaches, and headaches when we’re under stress, but what if we could understand what our bodies are telling us on a more specific level? Psychosomatic illness is an exaggerated version of these cues. By not paying attention to what our body is telling us, it becomes more and more adamant, until we literally become sick. If we can become exceptionally aware of this somatic language, we can become conscious of what was formerly only in the realm of the subconscious mind. Awareness is the first step. This process uses a kind of “active listening,” just as we use when we want to really hear what someone is saying. Your body tells you all kinds of things that would be useful if we heard them. A sense of tightening in the jaw or the throat might signal that you’re holding back something you need to say. A sense of not being able to breathe might be your subconscious telling you that you’re being suffocated by something. I actually had a client who’s asthma got much better once she made several changes in her career and relationship. If you notice low back pain flaring up when someone is yelling at you, it could very well be your subconscious telling you that you’re not standing up for yourself. Your conscious mind communicates primarily through words, so unless we specifically learn the somatic language of our bodies, there is a break in the circuit of communication between conscious and subconscious. The result of this is the tip of the iceberg being upset and confused by what the massive subconscious is doing, and having no ability to communicate a preferred course back to the body. By learning the somatic language of the body, we can then use cognitive linguistics to talk back to the body, and affect course corrections and real change. We can break habitual reactions, and replace them with thoughtful responses when we achieve a real two-way dialog. We can hear our body give us a somatic cue that’s like the backswing or the wind-up before the reaction, which gives us that moment to pause and insert a pattern interrupt. That pattern interrupt can be a cognitive linguistic command directing us toward a thoughtful, mindful response which will serve us strategically and well. Even when it’s just inside our own head we can make a difference. Self talk is a vast and powerful sea of opportunity for you. Those of you who know me have most likely played with the shift from the words “I’ll try” to the words, “I will do the best I can.” If you haven’t experimented with this, give it a shot. You’ll notice a distinct shift in your physical posture as you make a commitment (I will) a goal of quality (do the best) and an affirmation (I can.) Your body understands the difference in the words. Completing this circuit, and creating a dialog between our conscious and subconscious reduces regret, confusion, illness, and depression, and gives us an enormous boost in self-control, self-confidence, and abilities. Want to learn more about how to become the best you possible? Come visit the	web site, or better yet, contact me and see how we can design a program to fit your needs and desired outcomes. Special Offer! - "Say the Secret Word." Bringing back our FREE Dynamic Discover Sessions to the first 3 people (not already clients) who email me with this month's "secret phrase:" Summer of Love; in honor of the anniversary of San Francisco's short-lived consciousness movement. The Dynamic Discovery Session is normally $247, but just put that phrase in the Subject Line of your email, along with your contact info so we can schedule, and you can be one of the lucky winners! "I felt overwhelmed and was beginning to doubt myself and my success. Ian helped me harness what I had within to do what was needed. He's extremely insightful and effective, and in no time I found myself focused, organized, and best of all relaxed and stress-free." - T.U. - attorney, San Francisco Click to Schedule. Welcome to the Integram, where consciousness meets intentional design. Enjoy!